WASHINGTON -- Politics-obsessed Americans gathered at bars and restaurants Thursday with an excitement normally reserved for the Super Bowl or the World Series, ordering FBI sandwiches and morning shots of Russian vodka as James Comey testified about his dealings with President Donald Trump. Shaw's Tavern in Washington opened early and attracted a line of waiting customers seeking to watch the former FBI director's congressional appearance. A special menu was offered for occasion, with the sandwich, the vodka and Covfefe coffee - a coffee with whipped cream and cinnamon. The hearing blared on televisions mounted throughout the bar and on the patio. "This is massive," said Dani Robillard, 42, of San Francisco, who lined up outside Shaw's. She said she was in town to officiate a wedding and wanted to watch the hearing with people. Like others in line, she said she did not support Trump. A look at some other scenes as people paused from their weekday routines to take in perhaps the most anticipated congressional hearing since the 1970s. Todd Shaffer, 55, a commercial real estate agent in the crowd at Shaw's, predicted that little would get done in the nation's workplaces. "No one is working today," he said. That was true for Stephanie Williams, 22, of McLean, Virginia, who took the day off from her job as a public health intern. "This is the kind of thing our children are going to be talking about in history classes," she said. Orlando Lopez, 32, a self-employed Lyft driver, said he took time off as well. "I think there was obstruction of justice," he said. "I would like to see that come to light." Asked what he planned to order at Shaw's, he said: "I'd like to get a white Russian." The crowd grew quiet when the hearing began, but patrons reacted to key moments, with some applauding when Comey said Trump's administration spread "lies, plain and simple" and "defamed" him and the FBI. "When he called the president a liar basically, that was impressive," said Caitrin McKee, 35, of Silver Spring, Maryland. "I think (Trump) deserves to be impeached, and this could be the beginning." The hearing did not attract the same enthusiasm in suburban Atlanta. In the historic district of Roswell, Georgia, restaurants kept their regular hours, and boutiques and art galleries took little notice. "One thing I've learned is to stay away from politics, said Karen Stickney, the 61-year-old owner of an antiques shop who explained that while she is "very much Democratic," most of her customers are not. Of course, that doesn't mean she hasn't found a way to keep up. "I woke up early today so I could get the pre-testimony talk, to hear all the pundits this morning. I was almost late getting here," she said, shortly before picking up her smartphone - her inconspicuous method of checking the latest headlines. 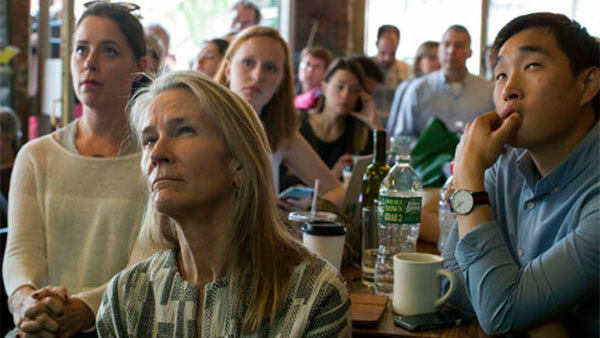 It was standing room only at the Brooklyn coffeehouse Building on Bond, which started broadcasting the hearing beginning at 9 a.m.
Marjorie Sweeney, a freelance writer who lives nearby, had high hopes for Comey's ability to take down Trump. "Hopefully, he'll redeem himself after blowing up the election," said Sweeney, who supported Bernie Sanders in last year's Democratic primary and voted for Hillary Clinton in November. Of Comey, she said, "He's working a few moves ahead of our soon-to-be impeached chief executive." Just as the testimony began, she made a toast with two other patrons, all with beers in hand: "To new friends and new presidents," she said. Not everyone was as interested. Clinton Jackson, 34, walked his dog outside the coffeehouse where patrons watching the Comey hearing spilled out the front door. "I have other things I'd rather be doing," said Jackson, who voted for Clinton last fall and works in advertising. He lamented the "reality show" atmosphere of the hearing. "It's a weird dynamic that's taking place right now in the United States." One Washington bar that did nothing special was in the lobby of Trump's hotel on Pennsylvania Avenue between the White House and the Capitol. Of the four TVs at the bar, three were tuned to Fox News coverage of the hearing, while the fourth showed French Open tennis. The TVs were muted, with quiet jazz playing over the lobby's sound system. That meant anyone who wanted to follow Comey's remarks had to read the captions. Plenty of velvet and leather seats at the bar were available, and at one point, there were as many reporters (four) as ordinary people having a drink and watching the hearing. Ravi Nallamothu and his wife, Padmaja Manyam, both 39-year-old physicians and Trump supporters from Napa, California, said they decided to have a drink at the bar and watch the hearing because the line at the nearby National Archives was too long. They wanted to see the hotel while they were in town. "It is Trumpian," Manyam said. Nallamothu said he read Comey's prepared remarks, concluding, "I don't think there's much there." "I think it's political theater," he said. "I don't think there's much they're going to get out of it." Peoples contributed from Brooklyn. Associated Press writers Ben Nuckols in Washington and Bill Barrow in Roswell, Georgia, contributed to this report.